Eddie loves a cave. He will slip off and hide out in several cave-like places we have created for him throughout the house. All cats need their own space and alone time and Eddie’s preferred space is a cave. One of his favorite caves is the Kivikis Cat House. 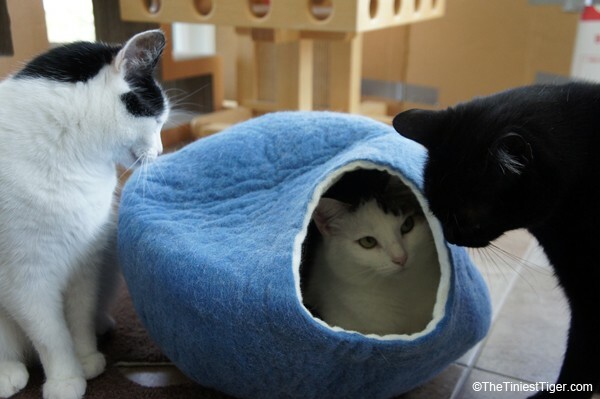 The Kivikis Cat House is a modern designed from wool cat house-bed. Hand felted from natural, ecological wool. This cat house is perfect for your cat to feel safe and snug while watching the action in the house or for a cat nap. . 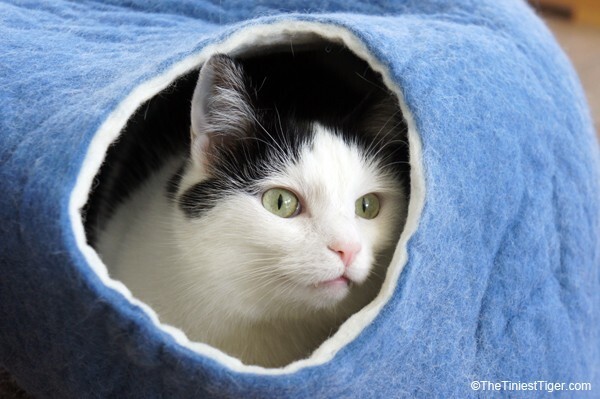 The bed is soft and warm, so Eddie thinks your cat will be happy with this cat cave too! Sometimes Annie tries to take over the cat cave. We think Annie does this just to get to Eddie because she is more of a tree-dweller than a cave cat. Don’t worry, Eddie can be persistent at getting his way and it wasn’t long until he reclaimed his cave. Tucked safe back inside his cave, Eddie surveys his surroundings to make sure Annie and Mercy are not plotting a takeover. Eddie loves his Kivikis cat house so much he wants to share one with a member of The Tiniest Tiger community. I would put it in the living room near the sofa, to offer a “private” napping place for kitties who like to stay near us when we’re watching TV or reading. I would put it in my den because it is a drafty room. I would give it to my friend who absolutely adores her cat! Dining room….is where all my kitties love to share the warmth of our wood stove. I know my orange boy would like to cuddle up in that. I might put this in my studio, for whoever is keeping me company in there on a particular day. It will go on our catio where our cats can safely watch the quail, cotton tails, javelinas, coyotes, bobcat and other desert dwellers. I would put it in the living room with hopes that our cats would enjoy having it there. We have three cats that we adopted 5 years ago when the mom cat and 4 tiny (3 or 4 days old) kittens were left at our vet. They all got good homes. We took the mom cat and 2 of the kittens, who have grown up bigger than their mom. I’m writing too much. I always do when I start talking about our cats. I would have this cave in the living room, that’s where all the cats hangout the most-should I win a cave, I’ll have to buy two more so none of the cats will have to share! I would put it in the garage for my semi-feral cat Sammy. He’s not quite ready to join the rest of the kitties in the house just yet. Right next to my chair because they all sleep with us! I will give it to my daughter who has 4 cats! I’ll put in the livingroom next to the couch. The cat cave would go in our front room-possibly under one of the side tables.Giving Chunky our cave dwelling cat somewhere to retreat to that looks much cuter than a basket under the sofa! Cute! I think my cat would love this! I have two cave dwellers and three tree dwellers in the house. I would love to see how this item is received before ordering more! In the bedroom since there isn’t room for everyone in bed at night. I would put it in the kitchen with their other stuff, like scratchers and tunnels and beds. My cats love hiding in objects of any kind. I would put this in the sunroom where is will be extra cozy. On the table near the large window, where he loves to spend the day. I am sure my Baby Girl would love this since she just love sleeping under the blankets when it is cold. I would put this in my living room, by the couch. That’s where my cats love to spend the most time, close to me. I would put it in the corner of the living room where Her Majesty can see anyone in the living room, dining room and kitchen. I would put my Meow’s Kivikis Cat House next to the fireplace, which she gets as close to as possible. I would put the kivikis cat house in the living room near the kitchen where whoever gets it can watch all the going ones especially in the kitchen. They love to know whatever I am making in the kitchen. In the living room next to her box of toys! I would probably put the Kivikis Cat House in my living room. I think I would put this on our dining room table. Its not used as it should be, but it would be a great place for her to be up high and without the dog bothering her. I think my kitties would love this by a sunny window! I would put it in our office by the window. A nap & a view! This would go in my sunroom beside the patio door so my cats would have a private place to watch the birds. I would put this Kivikis Cat House Bed in the main living room so that all my kitties and fosters can enjoy it and be with us while we’re relaxing in the evening. I would put it in the family room, as neither of my boys like to be far away from me! I have 11 kitties in my home, 5 of them are fosters. One kitten, Tabi, arrived with chemical burns on his feet and chin at the age of 4 weeks. He is very shy and spends his time under my bed. I would put this in my room next to the french doors, I think he would love it. He is now 6 months old and I think he will be a permanent resident. I’m not entirely sure which of the 5 fuzzies would use this, but I’m sure at least the boys would try it. Not sure if I’d put it near their cat trees or if I’d tuck it away somewhere more quiet. I’d have to try it out! My 22 pound Boaz, 8 years old, has his own house bed, but little 5 pound Zoe, six months old, is continually popping in there with him to snuggle. His attempts to hiss and/or bat her out of his house are misinterpreted as invitations to play, and Zoe rises to the occasion. She is as swift as that Tasmanian devil in the Looney Toons and, true to his kind and gentle nature, dear Boaz flees his house every time. Where does all this action take place? At the foot of my bed, where Boaz prefers to roost. A second cat house would be most appreciated. In our bedroom, right next to the bed on my side so Zepplin can sleep in it right next to me. My kitties would all want to climb inside together. I would put this in the living room so I could enjoy the happy baby sleeping in it! It would be perfect for my older boy when he wants to get away from the youngsters. Even his girlfriend may fit in there! Too cute – my babies will be fighting over this. The two old ladies ( both 16) will likely claim it before the ‘youngersters’ (both 7). My two kitties like to be warm and be near us so I would put this next to one of the radiators in the downstairs. That’s where we spend much of our time. Since my husband is allergic, we can’t have a cat. If I won, this would be a present for my best friend, who is kitty-centric. This would go great on the floor under one of the levels of their cat tree. My kitties would love this! Their beds are in the livingroom and this would be ideal right by their cat tree and scratchers which is their favorite hangout area! This would be perfect for the living room! My two kitties will just love this and will probably want it in the living room so they can look at us while snoozing in it. We have three cats. Two are young, but my Moko is an older girl who likes to spend much of her time in something like this. I think she’s really feeling the chill this winter, so I’d really love for her to be able to win this! In the bedroom- our littlest kitten would love it, as would our oldest boy! My Jax would love a cat cave. I’d keep it right in the living room so he can snuggle and still be near his brother Rajah and me. I would put it in the livingroom! My cat would love this he loves hanging in the living room so I would probably put it in there. My Kaine is a cave dweller. He gets under the sheets on my bed even during the day. I would find a hiding place he already uses to put the Kivikis Cat House so he’ll feel safer. The kitty house would be a permanent fixture in my living room. This way I will be able to see which of my 3 furgirls or perhaps 1 of my furboys is in it! I have 5 cats, & they spend most of there days lounging in the family room, so I would chose the family room. I have a few cats that will love this – but they will share! I would put the Kivikis Cat House bed near the woodburner where they all love sleeping. There are constant shifts around the burner so they keep toasty. I can only imagine who would end up in this. We run the furnace and the woodburner as it is super cold here in the winter and the cats would love a bed like this. Any one of my 6 cats would love to curl up in this cute cat bed. It would go in our family room where they like to spend most of there time with us. Luna likes to be in our company but pretend she’s not by hiding so this Kivikis House will make her very happy. She can watch tv with us peeping out of her House. She’ll love it. i would put it in the kitty room! This would go in my bedroom. She doesn’t sleep with me but likes to be near me. Wha a wonderful cave. I love my blue igloo and would love this cave so TW can wash the igloo. I’d put it up on Pop’s bed. In for my sweet boy TC, I know he’d just love to snuggle in this cat house bed. Not entering because Cody has had the exact same one for a few years now. He absolutely LOVES IT! Good luck to all who enter! 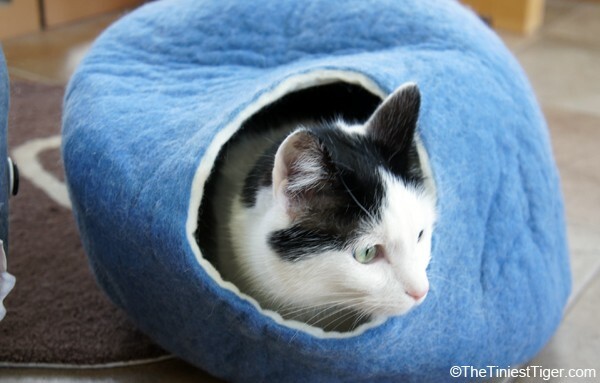 A warm and fuzzy cave for chilly winter nights, what cat wouldn’t want one? We’d put in the livingroom, where Thomas can curl up near us. I would put the house bed in my daughters bedroom. I would put it in my office/craft room so Fluffy has a place to hide if he hears a noise and gets spooked or the dog barks and alerts him to possible danger. I will put this is the living room so the cats can take turns hiding in it. Hurrah! Congratulations Susan! You are the winner of the Kivikis Cat House! We will be shipping your package to you via USPS Priority Mail today. Watch for shipping notification and tracking email. Thank you for being a part of The Tiniest Tiger community. Thank you, so much! I just now saw the message. In my bedroom by the windows for my kitties to lounge and see the world! I would put it in my bedroom since that’s where the majority of my cats hang out. I would like 3nfor my babies. They hide in sheet closet now with extra blankets. Cuties. My cat Cassie who is 14 years old and loves to be hugged so this would be a great bed for her. right in the living room so Toby can hang out with us in his cave! I would put it by my bed as I have a rescue cat that has anxiety and it would be perfect for her to be close to me. This will go in my office, where I work all day, and the kits hang out. My orange boy Tigger loves to nap underneath blankets. I think he would love this. My senior cat Maizy will be 13 and she loves to curl up, so she will get first dibs! We probably would put this in our humans’ bedroom so one of us cat sleep in it when they are sleeping. It’s very cool! I would put it in the kitchen with their other tunnels and toys. They have a whole section in the kitchen just for them. I would probably put mine in our bay windowsill! My kitty loves to hangout there and watch the birds. Maybe in the bedroom, since not everyone has room on the bed! I would put the bed exactly where my boy sleeps on the carpet to see if he would crawl into it. He has a box that I made into a hidey-hole that he uses occasionally so I am curious to see if he would like this type of bed. I’d put this in my living room in front of the electric fire (the cats’ prefered snoozing place). One of my cats is a burrower, so she’d love this. I would put it in our family room as he likes to play there. i would put this in the living room, the cats love it in there. I would put my Kivikis Cat House Bed by the window in the living room. I would put the Kivikis Cat House by my computer. This will give them a comfy place to rest while I am using my computer. I would put the bed in our family room- where we spend the most time. This would go great in my bedroom! I think my smallest feral Jasmine would love it!!! She would feel safe in there. MY caravan favorite place to sleep is in the washing machine so I’ll either put it in there or near the window. Thanks again for these giveaways! It will a difficult decision because my four fur-babies will want to be on the bed and in the kitty cave! I have wanted one of these for a long time. I know that they will love it! I would put in our living room in front of our tv. it would go in my bedroom or the living room…where the cats hang out the most!! I will put it under my raised bed. We have created a cat cave under there that our 4 special needs rescues love, especially our 3 legged kitty. In the LR , she has to be near us. Great bed! We would put it in front of the sliding glass door so the kitties could look outside. My cats would love this. But especially my black kitty Winston. He loves being under the covers. I’d put it in front of my balcony doors where there is a perpetual sun puddle. I would love to try one of these for my new kitten !! I would place this very enticing Kivikis Cat House Bed in our family room where we hang out most of the time. It would be such fun to watch the cats crawl in and cuddle up in this bed after getting tired from climbing and playing on our cat tree. They would love this! And so would we!!. Thank you for this wonderful opPURR-TUNA-ty to win! If we are the lucky winners, the Kivikis Cat House will be in the master bedroom, where it is sure to be enjoyed by all. I would put this under the night stand next to our bed. I think I would get a customer within seconds, lol! ? I would put it on my bed for my 17 year old Phoebe so she is warmer. She wants to be near me but is not a big fan of cuddling. I would put it on my bed. We are having a rough winter in Ohio, with bitterly cold temperatures. My two rascals would enjoy snuggle up in this Cat House. I would put it at the end of my bed for Winston, my elderly cat with chronic pancreatitis. He loves extra warmth! I would put it in the bedroom first as that is where we have just one cat bed. Shovel uses that one. But I think he’d love the cave. If it doesn’t work there, it will go in the living room as Shovel spends his time there on my lap. Toothpick is perfectly content to sleep on my head or if I am not there, he sleeps on my pillow. Love my boys. I would probably move the Kivikis Cat House Bed around the house….when I am out at work, I would put it on my bed near the wall so the baseboard heat gently warms it. When I am home, I would place it in the living room on the couch so Sherlock could look out the window if he chose. This is so cool! I would put it by the front balcony door where my older cat, Naima, loves to sit and catch the sun. I’d have to get a second one for my younger cat, Tesla. I would put his in my sewing room, which seems to be his favorite place to hang out when I’m not home. The Kivikis Cat House cave would be placed in my office. I know all the cats would like it. I am hoping our feral rescue would view this house as his safe place. I’ll put this cat house on our Willow’s favorite chair. She’s a long-haired cat but needs shaved for health reasons. It’s very cold here. Willow needs this to stay warm! My one kitty is very skittish and would like one of these to feel secure in. i would put in in the living room under the piano so my kitty will not be disturbed. Hallway bench is where I first try the Kivikis Cat House Bed as the entry hallway bench is Mitzi’s favorite spot to nap and with this fridgid winters she would love a cave to nap in! It’s lovely, I would put it in the living room so that they could hang with me still. I would put Kivikis Cat House Bed on the corner of my bed. They love to. Sleep there. I would put my Kivikis Cat House Bed on the couch so the kids can sit in it while I read or watch tv. we would either put the Kivikis Cat House bed in our sunroom which is really the cat room or our living room. They spend most of their time between the two rooms where there are lots of windows and high places for them to rest and look over the squirrels and birdies. I would put the Kivikis Cat House Bed in the livingroom because she loves to be with us and spends most of her time in the livingroom where we all spend time. I would put it on the top of my kitty tree. That is where my little heat seeking meezer mix likes to hang out. My kitty and I experience very cold winter days (-40C with the wind chill recently) and colder nights. The Kivikis Cat House would go on my bed on the 3rd floor where it is warmest, so that my kitty can keep warm while I am away at work and especially at night when the house is kept even cooler to save on energy. I have to make sure that my kitty has warm places to hide in case the furnace would ever stop working while I am away. The Kivikis Cat House would be so much better than the tent I make kitty out of the cushions on the bed! The kitty cave would go in a nice corner in my bedroom where my kitty can observe all the goings on ? I would put it in the living room near a heater, so it will be super cozy. I would put this bed in the living room where all the cats can gather and enjoy. We have many as we rescue and they would all want to snuggle in it. I’ve got one of those shelf organizers so that I have enough room for both my human and cat things and this would sit perfectly on the top shelf!! My youngest likes to get up as high as felinely possible and would enjoy this. Happy New Year!! I would put it in the living room by the window right in the midst of things!! I would put the cat cave on the wide shelf near the window where the cats love to watch the world and then take a nap. right in the middle of the living room floor! I know all 3 of mine will be so curious and have to check out what it is. “Where will you put your Kivikis Cat House Bed?” On the floor, where Kitty will most enjoy it! I will put it where Peggy Sue can use it. She has a deformed leg and my other cats sometimes push her out of the other beds. Amy will choose where it goes, perhaps in the back room where she enjoys her private sleep time. I will put it in my cat room. It can replace a box with a blanket. I would move it from our bed to the living room but would probably leave it on the bed more only because all 4 sleep there the most. I’d put it on my bed where they like to snooze. I would bring this to the Hull Seaside Animal Shelter as a donation. I know several kitties that would love this! I would put it in my bedroom! I would put the bed in my bedroom for my kitty Garfield.